S/4HANA 1809 was recently announced and there are several improvements and new featured introduced in different areas. The release highlights talk about new featured for Demand Driven MRP, Co-Pilot and many new features of the intelligent ERP. There is a minor and under-noticed feature, however, which will make a huge difference in the daily life of the MRP Controllers who need to deal with multiple MRP Areas. Since the first S/4HANA release, SAP introduced simplifications in the subcontracting process and in the storage location planning. Old scenarios where a special stock segment for subcontracting or for a storage location planned separately were no longer supported and they should be replaced by subcontracting MRP areas and storage location MRP areas, respectively. While working with MRP areas brings lots of benefits (as I mentioned in my previous blog 5 reasons to use subcontracting MRP areas in S/4HANA. ), there was one negative effect of using MRP areas: while the old features allowed all the subcontracting and storage location stock segments to be visualized in the same screen in transaction MD04, each MRP area had to be opened separately. In some situations, the same material may have different subcontracting suppliers or different storage locations planned separately and using MRP areas in those cases would not make the life of the MRP controller easier. 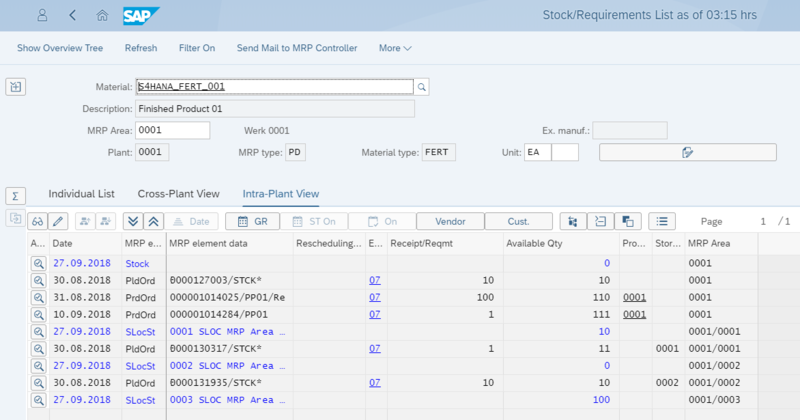 After hearing the feedback of different customers who migrated to S/4HANA, SAP implemented a new feature that will improve the visualization of the Stock/Requirements List for MRP Controllers planning multiple MRP Areas. 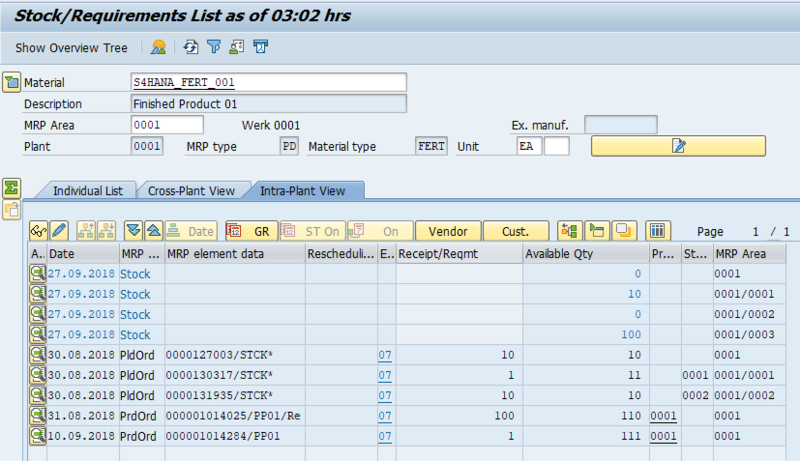 As of S/4HANA 1809, the new Intra-Plant view was introduced in the Stock/Requirements List (transaction MD04), allowing the MRP Controller to have a complete overview of the Stock/Requirements situation, visualizing the multiple MRP areas for a material in the same screen. In the new Intra-Plant View, there is a new set of buttons that will allow the MRP Controller to choose the best way to visualize the multiple MRP areas and quickly switch between different views. The figure below shows multiple storage location MRP areas assigned to the same material with a look and feel very similar to the old storage location planned separately. This innovation is also not only available it the SAP GUI, but also when using the Stock/Requirement List in the Fiori Launchpad. Another possibility is to have a non-aggregated available quantity, so that we can tell exactly how much do we have under each MRP area, but show all the MRP elements aggregated. We can also completely switch off the aggregation and see the plant and the MRP areas together, as if there is no separation between them. Each user can choose the best option to work and quickly switch between different visualization modes, or can define the preferred visualization in the user settings, by going to the menu Settings and choosing the option User Settings. 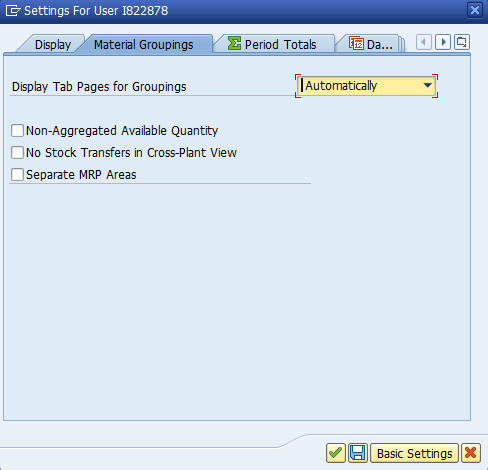 Here, it is also possible to define if the grouping tab will be displayed or not. It is important to reinforce that those options will be only relevant for displaying the MRP results in the Stock/Requirements List, but they will not be relevant for planning and each MRP area will be planned independently by MRP. Very useful documents to being latest update in S/4 HANA. Thank you for the feedback Prasath! Thanks for such an informative information. Thanks for sharing. Good blog as usual from you Caetano !! Nice info Caetano! Thanks for sharing! 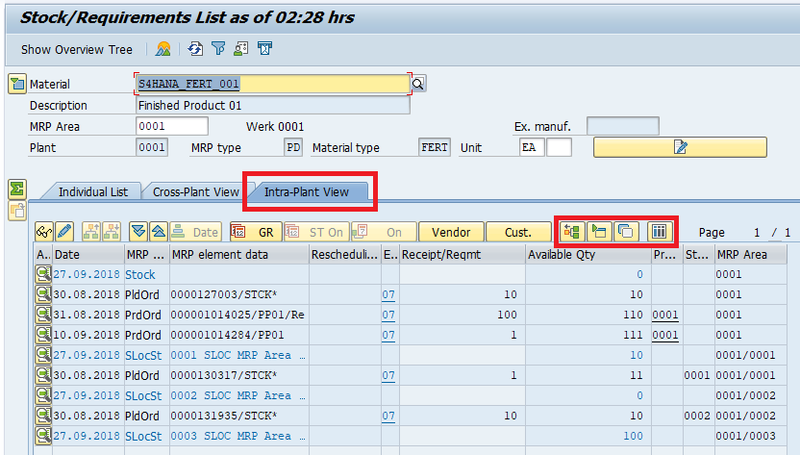 I am not able to view the Intra-Plant tab in MD04 after maintaining the settings suggested by you, can you please guide. It should appear if you have multiple MRP areas for a material and planning elements on these MRP areas. As we define MRP area for Subcontractor, if we have multiple subcon vendors we will have to create multiple MRP areas. Can you please help me understand if there is any way possible to create 1 MRP area for multiple vendors and see the biffurcation in MBLB or any other way to track the stock at vendor location. Your question is not exactly related to the topic of this blog, so please open a separated question under the same tag.